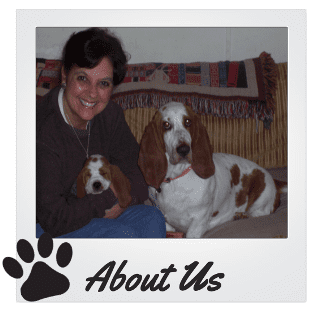 We are basset hound breeders located in beautiful pilot mountain north carolina. In the middle of winston -salem and Mt. Airy. (Also known as Mayberry)!! My sister Sandy, and I live a couple miles apart and both share a passion for basset hounds,and a love and respect for all animals.To this very day…It is very likely that we will hold up traffic to move a turtle out of the road!!! In 2003 my sister Sandy got her first basset hound (Marlo). It was in 2005 that I moved here to be closer to my sister,and it has been basset madness ever sense!! At this time ..we have quite a few bassets between us. Many of them are seniors and have retired to the couch. I personally have several breeding females, and my sister Sandy has several as well. We never rehome our basset hounds that are retired or are no longer in our breeding program! They are our family….and will live out their entire lives with us. With that being said….we have a total of alot of basset hounds between my sister and I!!!! I guess it is fair to say that we are more than just a Basset Hound Breeder..Bassets are our life!!! We feel very blessed to be surrounded by such unconditional love!! Our mother ,Penny ,gets all the credit (or Blame)…for raising daughters that do nothing just a little bit !!! It is all or nothing for us and that is the standard that we have for the care of our dogs and puppies!! Our mother is who we call ..”the grand-nanny”. When we have a litter of puppies …she is very involved, and is the person we depend on for puppy sitting.!!! Our puppies are not left alone for the first couple weeks of there lives. If we have to go to work or shopping……We just call mom!!! We learned a long time ago that the first weeks of a puppies life are fragile and leave no stone unturned to ensure they are safe and momma dog doesnt accidentally lay on them!! We have great relationships with our veterinarians and never cut corners when it comes to the health of our dogs and puppies. The past many years I have imported and purchased many European basset hounds, and others with euro lines. My European basset hounds have impressive champion lines from the best kennels in Europe. ( Gloomy Clown,Queens Hermelin, Moravia Bray, Van Grunsven, Swede sun, Lady Barnette, Van hollandheim)…just to name a few!!!! I am very proud of all our dogs , and am happy that I am fortunate enough to have them in my life . All of our dogs are special to us . It doesnt matter if they were rescued, born in our home, purchased from another breeder or imported from another country!! Love is Love, and to us… that is what its all about. Lowdown love. Plain and simple.